Longtime readers know I’ve been pounding the table about uranium. 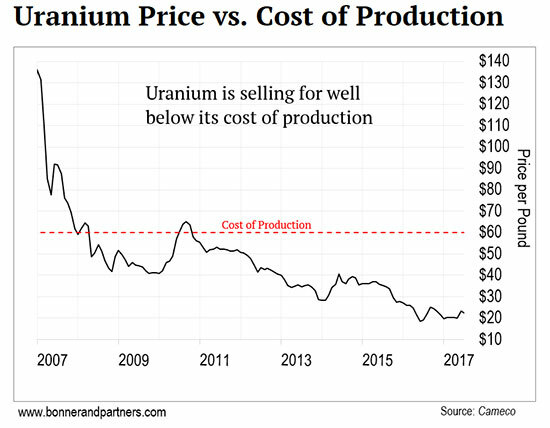 I think the price of uranium is about to soar, making it the perfect “crisis investment” for 2018. Uranium is a beaten down and hated asset with massive profit potential. The crowd has left it for dead… just the sort of thing that piques my interest. I first told Crisis Investing readers to add some exposure to uranium in November 2016. The timing was perfect. It marked the ultimate low for uranium prices (circled in red below). Now, I’ve identified two supply-side catalysts for uranium’s next big jump. You’ll find all the details about the inevitable uranium bull market, including why it’s now imminent, below in a conversation with my friend and colleague Chris Lowe. As many of you know, Chris is the editor of Bonner & Partners’ Inner Circle. 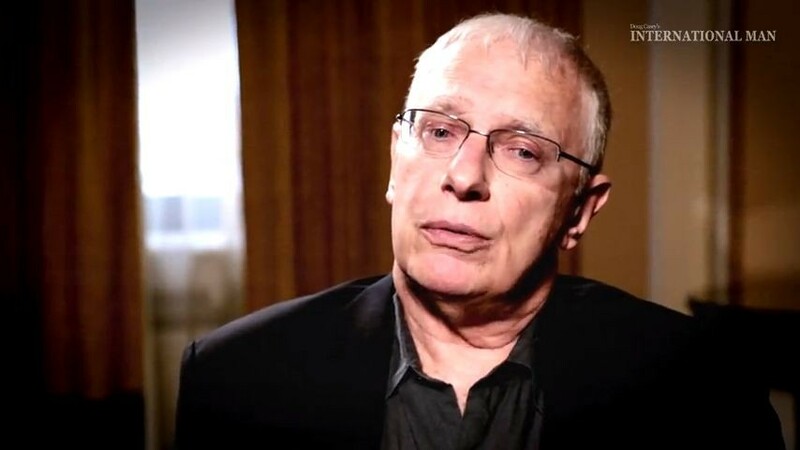 His publication shares insights from Bill Bonner’s personal global network of analysts and investment experts. Chris Lowe: We’ll get into the details of the two catalysts for higher uranium prices you’ve identified in a moment. First, can you catch readers up real quick on why you believe uranium prices are set to skyrocket? Nick Giambruno: I’m a crisis investor. I take advantage of aberrations of mass psychology to pick up beaten-down assets for pennies on the dollar. And right now, it’s hard to think of a market where sentiment is worse than the uranium market. As I’m sure you recall, in March 2011, Japan experienced a nuclear emergency at its Fukushima Daiichi power plant. After a 50-foot tsunami struck the plant, its nuclear reactor went into meltdown. This released radioactivity into the sea and air. Afterward, Japan shut down all 54 of its nuclear power plants. This ushered in a bear market in uranium. Demand collapsed. A supply glut followed. The price crashed from about $85 per pound to as low as $18. That’s far below the cost of production, which is about $60 (the red line in the next chart). Today, uranium sells for about $24 per pound. That’s off its low. But it’s still well below the cost of production. Uranium miners are losing money on every pound they produce and trying to make up for it in volume. This situation can’t last. Either the price of uranium will rise to meet the cost of production… or the lights will go off. Chris Lowe: What kind of profit potential can readers expect as this process plays out? 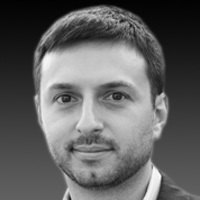 Nick Giambruno: The last bull market in uranium lasted from 2001 to 2007. During that time, uranium went from $7 a pound to $136 a pound. Today, we’re in the early stages of a new uranium bull market. It has the potential to hand investors the same kind of eye-watering returns. Remember, commodity markets are highly cyclical. And right now, the price of uranium is already heavily beaten down. So it has limited downside. Meanwhile, the potential for upside gains is enormous. I can’t think of another market with a better risk-reward ratio right now. Which is why I’m so excited about it. It’s one of the best crisis investing opportunities I’ve ever seen. In 1 day, this gentleman almost lost his entire $1,000,000 life savings. But by using his “secret key” technique… he saved all his money… generated a fortune… and got to retire at 42, with more security than he'd ever imagined. The most surprising part? His “secret key” wasn't a one-time tactic. It's been responsible for 389 winners and counting… and he's been quietly using it for the past 26 years to make millions. Click here and see his “secret key” in action. Chris Lowe: You first recommended uranium to your Crisis Investing readers in November 2016. That was around the time Donald Trump was elected president. Is the Trump presidency good news for uranium bulls? Nick Giambruno: Trump’s election was an important catalyst for the uranium market. The president knows that nuclear power is critical for maintaining America’s energy independence. And it matches up perfectly with his “America First” platform. Trump is already actively working to build new nuclear power plants. And he’s moving to ease regulatory burdens on mining uranium. But the most interesting developments are happening thousands of miles away from Pennsylvania Avenue. Chris Lowe: Can you share what they are… and why they are so important? Nick Giambruno: Sure. First, let me give you some background. Most uranium is produced in countries friendly with Russia, such as Kazakhstan. These countries are not exactly US allies. Other producers, such as Niger in western Africa – where France buys most of its uranium – are plagued by instability from Islamic insurgencies in neighboring countries. Meanwhile, no one is building any new uranium mines. No sanely run business would build a uranium mine when it costs $60 to produce a pound of uranium but they can only sell it for $24. Prices will need to rise to at least the cost of production – $60 – before anyone has good reason to build a new mine. Even then, it would take at least seven years of permitting and construction to bring a new mine online. Supply is already tight, in other words. Now, two “supply shocks” are about to take roughly one-quarter of the world’s uranium supply off the market. In oil-market terms, that’s roughly double the production capacity of Saudi Arabia. Just imagine what would happen to the price of oil if two producers the size of Saudi Arabia were to suddenly stop pumping. It would instantly make front-page news… and send oil prices to the moon. Chris Lowe: Where are these supply shocks coming from? Nick Giambruno: The first is from the McArthur River Uranium Mine in Canada. Cameco, the world’s largest publicly traded uranium company, operates the mine. It accounts for about 12% of global production. Last November, Cameco unexpectedly announced it was shuttering production at McArthur River. There’s nothing wrong with the mine, or the company for that matter. It’s simply better for Cameco to leave the uranium in the ground and wait for higher prices. As I mentioned, most uranium is mined in unstable or politically unfriendly jurisdictions. Canada, on the other hand, is a stable, mining-friendly place. Eliminating that much supply from a stable jurisdiction makes this shock even more profound. The second supply shock is coming from Kazatomprom, Kazakhstan’s government-owned uranium company. Last January, the Kazakh government announced it would cut the country’s uranium production by 10%. That translates to a 3% fall in the global uranium supply. Then in December, it announced that it would eliminate about 7.5% of global uranium production each year for three years, starting in 2018. With Kazatomprom’s earlier announcement (3% of global supply), Cameco’s production cut (12%), and Kazatomprom’s latest cut (7.5% each year for three years starting in 2018), producers will supply 23% less uranium to the market in 2018 than they did in 2017. Chris Lowe: Where does that leave the uranium market… and uranium prices? Nick Giambruno: Ready to rebound. At the start of last year, few people expected an almost one-quarter cut to global uranium production. This is a historic supply shock. It can only propel uranium prices up. Chris Lowe: Clearly, uranium has the capacity to deliver stellar gains. In the last bull market, the price per pound soared more than 1,800%. 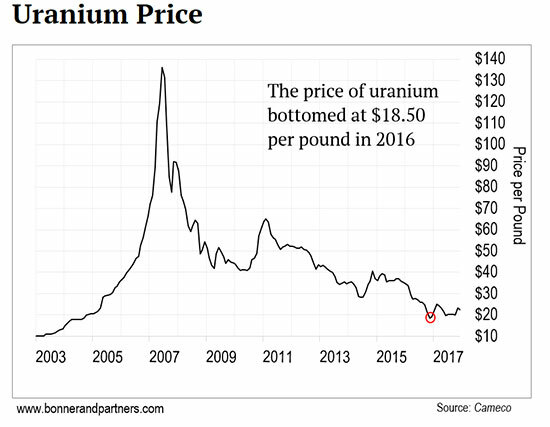 Why does uranium have such extraordinary price spikes? Nick Giambruno: Uranium mines don’t have easy on/off switches. Once producers take uranium supplies off the market, it’s hard to bring them back online again. From permitting to production, it can take over seven years to bring a new mine online. The only thing that could derail the coming bull market in uranium is another Fukushima-like nuclear emergency. Short of that, an increase in uranium prices is inevitable. As I mentioned, producers need a 150% rise in the price per pound just to break even on every pound they sell. And if the last cycle is anything to go by, that’s just the beginning. Prices could go a lot higher than that. That’s what makes this situation so urgent. 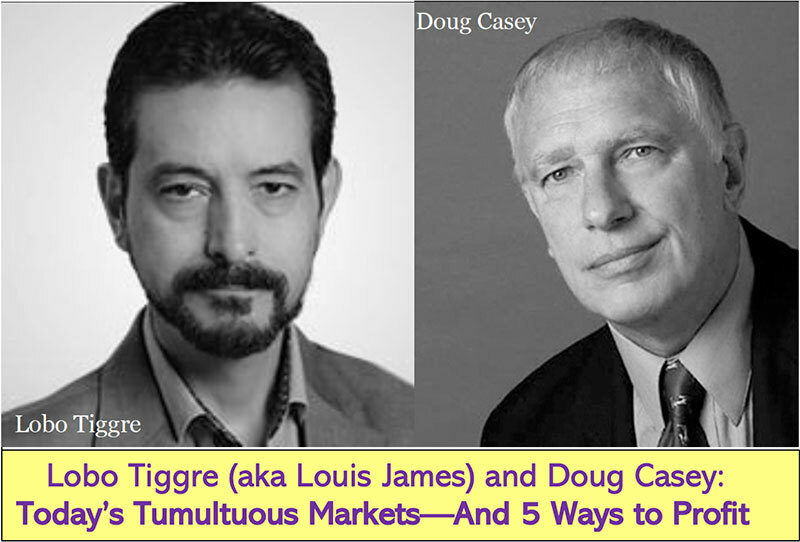 For example, Doug Casey made his readers an absolute fortune in the last uranium bull market. Paladin Energy, a company Doug recommended at the time, leaped from one penny to $10 per share. That’s a 1,000-fold increase. In other words, a $10,000 position could have exploded into $10 million. Even the worst-performing uranium companies delivered 20-to-1 returns. And now, there’s no doubt we’re entering another massive uranium bull market. Doug and I will discuss this – along with other profitable speculations we see building up right now – at the Legends of Finance Summit on February 8. Readers can attend this free event right from their home computers by reserving a spot right here.